These shrimp are infused with the sweetness from the pineapple and a hint of spice from the chili sauce. This is a great way to prepare seafood that has a tropical flair to it. Serve with grilled vegetables and rice for a truly memorable meal. Combine marinade ingredients in a large bowl. Add peeled shrimp, coat well, cover and allow to marinade for 10-15 minutes in refrigerator. Preheat grill for medium-high heat. 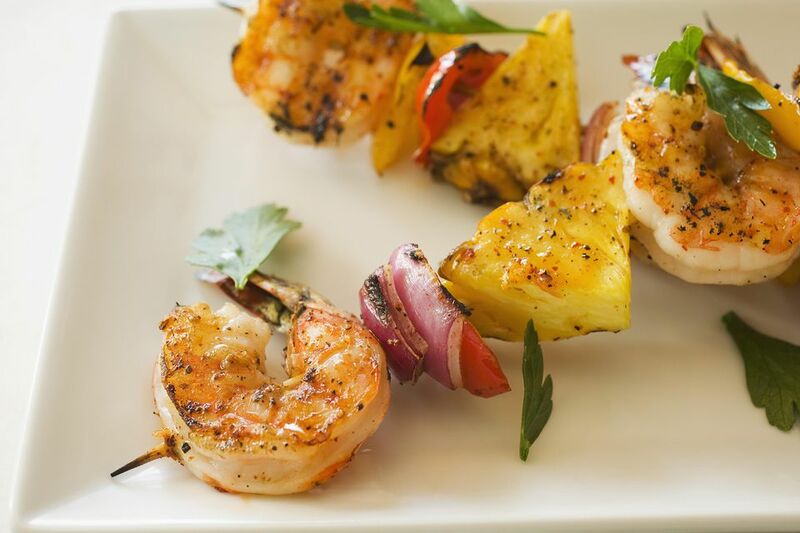 Remove shrimp from marinade and thread onto skewers alternating between pineapple and red onion chunks. Place reserved marinade in a pot over medium-high heat, bring to boil, a reduce heat to medium-low and cook for 5-6 minutes, stirring occasionally. Watch to make sure that it doesn't burn. You can cook the marinade on the side burner if your grill has one. Once cooked, remove from heat and cool. Place shrimp kebabs onto grill and cook for 3-4 minutes per side. Remove from heat and serve with sauce drizzled over top.